To close out the As, we have another classic, the Azer. 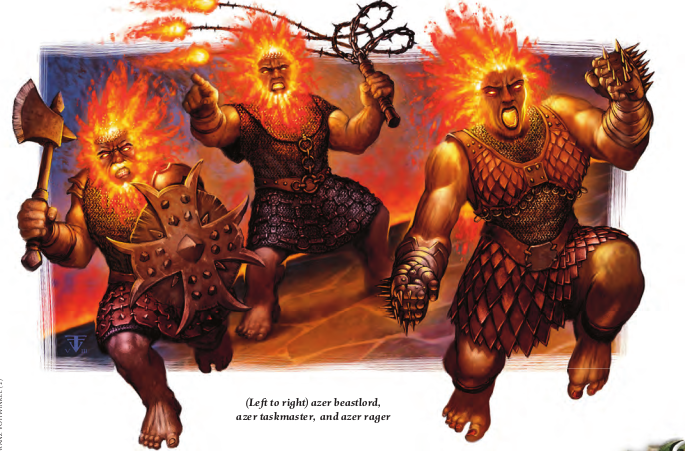 I remember them from D&D 3.5 as basically dwarves that are on fire. Here we get a tiny bit more background tying them to the Fourth edition cosmology. Way back at the dawn of time, dwarves were all slaves to the giants. Eventually they rebelled against their masters and escaped into the world, where they would proceed to build their own civilization. Well, most of them did. Those that stayed behind were mutated by fire giants and transformed into azer. Some of those broke free later, but some remain enslaved as laborers and guards. So if you’re raiding the castle of the fire giant king, you’re going to run into troops of azer before you start seeing giants. They’re Unaligned and about as intelligent as regular dwarves, so you might be able to negotiate with them and foment rebellion. Azer don’t have a Monster Vault counterpart. As inhabitants of the Elemental Chaos, 4e Azer are paragon-tier opponents. We get several stat blocks for them here. The signature Azer traits are Resist Fire 30 and Warding Flame: each enemy that starts their turn adjacent to 2 or more azer takes 5 fire damage. They are not particularly vulnerable to cold. The Azer Warrior is a Level 17 Minion, useful for padding out encounters involving fire giants or azer regulars. They attack with warhammers that do fire damage and a tiny bit of ongoing fire damage. The Azer Foot Soldier is a regular version of the warrior, a Level 14 Soldier with 141 HP. his equipment and attack (singular) are pretty much identical to the Warrior’s, aside from having normal rolled damage for their level. The Azer Rager is a totally metal Level 15 Brute who has 181 HP. She attacks with gauntlets that menace with spikes of fire (and cause ongoing fire damage). When bloodied, she can call upon Chains of Flame, which cause fire damage in a Close Burst 5 around her and immobilize enemies who were already on fire from other attacks. The Azer Taskmaster is a Level 17 Controller (Leader) attacks with a scourge that menaces with spikes of fire (and does a mix of physical and fire damage). Once per turn it can cause a nearby enemy who just took fire damage from any source to also take ongoing fire damage. This guy is probably an exception to the negotiation bit - he likely gets special privileges in exchange for keeping the other azer in line. The Azer Beastlord is a Level 17 Soldier (Leader) or, in other words, a hellhound wrangler. His basic attack is a battleaxe that mixes physical and fire damage, and marks on a hit. The real attraction here are his other powers, though. He can make an allied elemental beast recharge one of its encounter or daily powers as an at-will minor action, and once per encounter he can hand out a free attack to every allied elemental beast who can see him and is flanking an enemy. Level 14: One pair of azer footsoldiers and one pair of salamanders. These poor sods escaped the fire giants only to be enslaved by salamanders. Level 15: 6 warriors, 2 ragers, and one immolith demon. These poor sods have it even worse. Level 17: One taskmaster, one beastlord, 8 warriors and 1 firebred hellhound. These could be free azer! You should totally swap the warriors for another 2 hellhounds. Dwarves on fire! The foot soldier is a bag of HP with a single melee attack, so it’s quite boring on its own. The others are a bit more interesting, though I feel like the taskmaster should have a ranged attack of some sort. In fact, the azer lineup in this book is very lacking in ranged firepower, so they need some external artillery support. They also suffer from the classic “fire monster in a fire dungeon” problem, where any smart party will prepare themselves to resist much of their damage. The most fun of the lot is definitely the Beastlord, particularly when associated with a pack of hellhounds or even other, non-fire elemental beasts. If your previous exposure to Azer was the low-level stat block in the 3.x monster manual, seeing them as mid-to-late paragon tier creatures might be a bit jarring. Their abilities are simple enough that you could comfortably reduce their level by 10 or so to make them appropriate for heroic tier games without changing what they do in combat.